The Alaska Railroad was back in the black in 2017 with a $22.4 million profit after 2016 saw its first net loss in more than 15 years. The state-owned railroad corporation increased its overall revenue by 13 percent last year while cutting expenses by 3 percent, according to its 2017 Annual Report issued April 2. Alaska Railroad CEO Bill O'Leary said the improved financials are the result of the railroad's resolve to forge ahead through making difficult but necessary decisions. In February 2017 O'Leary announced the railroad would be eliminating 49 positions as part of an internal restructuring effort to save $5.7 million. Since 2008 the railroad has eliminated more than 300 year-round positions as freight business has declined. 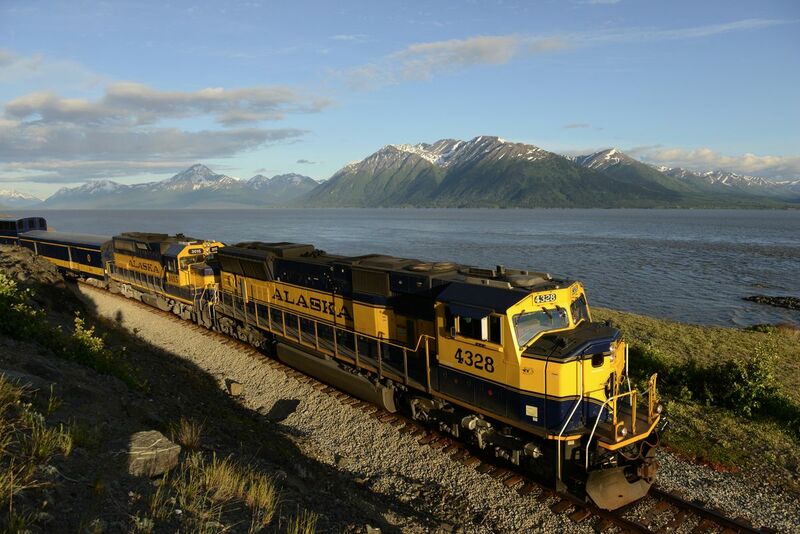 The Alaska Railroad currently has 544 full-time employees with another 130 seasonal positions, according to the report. The stronger 2017 revenue figures were driven by continued growth in the railroad's passenger service — largely attributable to Alaska's burgeoning tourism industry. Ridership hit 506,000 passengers in 2017, which continues a general upward trend since bottoming out at 405,000 passengers in 2010. The report also notes that winter and "shoulder season" ridership has nearly doubled since 2013, going from 6,300 passengers to nearly 11,200. On top of its own regular passenger service, the Alaska Railroad also operates numerous trains for tour companies during the summer months. Passenger service has historically accounted for about 20 percent of the railroad's total revenue. While technically a state corporation, the Alaska Railroad does not receive state funding as part of its normal business operations. A boom in gravel demand from Southcentral road construction projects also helped the railroad increase its total freight hauled by more than 1 million tons, according to the annual report. Until hauling nearly 4.8 million tons of cargo last year, freight tonnage had steadily declined from 6.3 million tons in 2010. The Alaska Railroad moved just 3.7 million tons of freight in 2016. The declining trend in freight business reflects Alaska's overall economic recession as well as the 2014 closing of the Fairbanks-area Flint Hills Resources oil refinery, which was a major customer of the railroad. Other lines of freight business — the railroad's barge service, petroleum and domestic coal transport — all fell by 8 to 14 percent. The railroad did not haul any coal for export in 2017, according to the report. Freight accounts for roughly 40 percent of the railroad's revenue. The railroad ended 2017 with $6.4 million in operating income after absorbing an $11.2 million operating loss in 2016. Also a large landowner with title to about 37,000 acres across the state, roughly half of which is revenue-generating real estate properties, the railroad netted $12.5 million in real estate income last year compared with $11.7 million in 2016. Other acreage is used by the railroad in its business, such as for right-of-ways. The Alaska Railroad held a net position of $338.7 million at the end of 2017. Railroad leaders are expecting a $13.5 million profit in 2018, according to the annual report, which would be in line with the several years of profits prior to the $4.4 million loss in 2016. Aside from the improved operating and real estate financials, the railroad was also able to capture formula-derived grant funds from the Federal Transit Administration that were off-limits in 2016 due to a disagreement with the Municipality of Anchorage over how the FTA grants were split. Anchorage Mayor Ethan Berkowitz's administration in 2016 pushed for a larger split of about $15 million in annual FTA funding, which is shared by the railroad and the city. Berkowitz argued that while the railroad generates much of the federal grant money through its passenger service, the money is intended for supporting public transit in urban areas, which is not what the railroad provides. Without agreement between the city and the railroad the FTA would not release the funding to either. As a result, railroad leaders attributed the $4.4 million loss in 2016 to not getting the $11 million in expected FTA grants that year. The two sides reached an agreement last August to settle the dispute in which the funding would be split as it historically has been with the railroad getting the majority of the grants — equal to what it generates. However, the agreement also includes the railroad selling a 20-acre parcel adjacent to the Port of Anchorage to the city for $1.5 million. The property is viewed as an important piece to the city's much-needed work to overhaul and modernize the port's dock infrastructure. Related to that, on April 9 the state Senate passed legislation to allow the railroad to sell land without approval from the full Legislature. Instead, Senate Bill 86 would give the Legislature 90 days to approve or reject railroad land sales and give the railroad authorities similar to what other state land management agencies and the University of Alaska have, according to a Senate Majority press release.